S2208MC-02Video Rocker - This unique design video rocker comes with 2.0 sound system that gives you great entertainment for games, movies nad music. 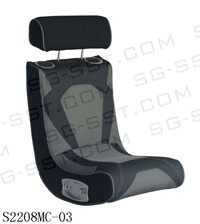 Also comes with adjustable headrest to suit your sitting positioning. And with A/C and D/C selection, you can go outdoor with any portable player. Foldable for easy storage and No assembly required. S2208MC-03Video Rocker - This unique design video rocker comes with 2.0 sound system that gives you great entertainment for games, movies nad music. 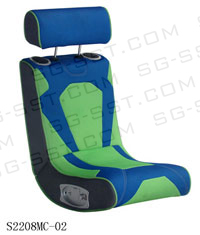 Also comes with adjustable headrest to suit your sitting positioning. And with A/C and D/C selection, you can go outdoor with any portable player. Foldable for easy storage and No assembly required. 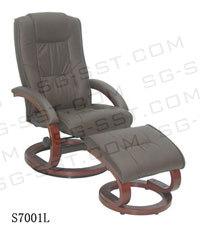 S7001L Swivel Recliner W/Ottoman is Upholstered in cow top leather with Recline & swivel 360 degree. It is Ergonomically designed with Fire Retardant foam, Bentwood frame and Matching ottoman. 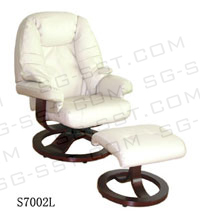 S7002L Swivel Recliner W/Ottoman is Upholstered in cow top leather with Recline & swivel 360 degree. It is Ergonomically designed with Fire Retardant foam, Bentwood frame and Matching ottoman.